PIERRE, S.D. — Winter wheat plantings in South Dakota last fall totaled only 900,000 acres, down nearly one-fourth from the previous year to one of the lowest levels in years. 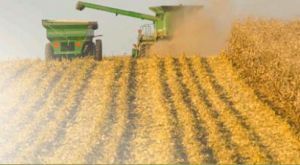 In its first estimate of the crop Thursday, the U.S. Department of Agriculture reported the numbers, which are down 24 percent from the 1.18 million acres planted in September 2015. The reason for the drop includes more than just the growth in popularity of corn and soybeans in recent years, the Capital Journal reported. South Dakota Wheat Commission Executive Director Reid Christopherson said farmers likely planted fewer acres of winter wheat because there was a big-yielding crop last year, which produced lower protein content and brought down the price of winter wheat. "When we were back, about the end of August, just when a lot of decisions were being made about planting (winter wheat for 2017 harvest), the spot price for winter wheat in central South Dakota slipped below $2 a bushel," he said. The drop has made farmers look into other crops, like corn, soybeans and sunflowers, for income. This means, a smaller amount of acres that will be planted in South Dakota in September. The gap between winter wheat prices and spring wheat prices has also been high at about $1.30 a bushel, Christopherson said, with spring wheat more valuable. "We basically have full year's crop of wheat in the bin in South Dakota," Christopherson said.